Interesting things happen when little boys grow up with sisters: They are less likely to help mom with housekeeping chores—and they’re more likely to grow up to be Republicans, according to a new paper published in the latest issue of the Journal of Politics (doc). The analysis is based on surveys of more than 3,000 individuals each that were conducted in 2006 and 2008 as part of the ongoing National Longitudinal Survey of Youth’s Children and Young Adults. The survey series, which began in 1987, follows the progress of children 10 years of age and older who were born to women who participated in an earlier large-sample survey fielded by the Bureau of Labor Statistics. Respondents were in their 20s and 30s at the time of the 2008 survey, though most of the respondents “were on the young side of this range,” the authors wrote. Using a sophisticated statistical technique designed to identify causal relationships, they found that the impact of having sisters rises as the share of siblings who are sisters increases. The sister effect is smaller but still statistically significant when it comes to attitudes explicitly related to gender roles. Men who had sisters were 3.8 percentage points more likely to agree that “a woman’s place is in the home” than men who did not, wrote Healy, an economist who teaches at Loyola Marymount University in Los Angeles and Mahhotra, a Stanford University political scientist. The researchers found that birth order and age difference between siblings also play a role in views on gender and politics. “The sibling gender effect is stronger for respondents who are close to their siblings in age and somewhat stronger for first-born respondents,” they wrote. The researchers also found that while growing up with sisters had an impact on young boys, it had no significant effect on young girls; their political or gender attitudes as young adults were no different from those of women who did not grow up with sisters. But does the sister effect persist across an individual’s lifetime? We’ll have to wait to see what happens when these young people are interviewed in future surveys. Other data suggest the answer may be no. Healy and Malhotra analyzed data collected in the University of Michigan’s Political Socialization Panel study. For this project the same individuals were interviewed four times between 1965 and 1997. In the early waves of the survey they found about a 15 percentage-point difference in the probability that men in their late teens and 20s would be Republicans. But the “sisters effect” slowly diminished in later surveys as these men moved into their 30s and had dropped to a statistically insignificant 5.7 percentage points by 1997 when most were in their mid- to late-40s. In the final survey in 1997, men in their 40s with sisters were still 12.5 percentage points more likely to agree with this statement than men with only brothers. 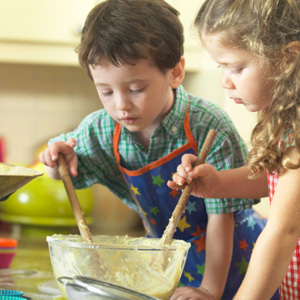 Are gender roles within families changing? Studies by the Pew Research Center suggest the answer is yes. See our reports: Modern Parenthood, A Tale of Two Fathers, Modern Marriage.